New research by scientists at Edaphic Scientific, an Australian based scientific instrumentation company, and the University of Queensland, Australia, has found a technique that can simply and rapidly determine when a plant requires irrigation. The technique builds on the strong correlation between stomatal conductance and plant water potential that is found across all plant species. However, new research applied this knowledge into a technique that is simple, rapid, and cost-effective, for growers to implement. The classic textbook values of plant hydration are field capacity and permanent wilting point, defined as -33 kPa (1/3 Bar) and -1500 kPa (15 Bar) respectively. It is widely recognised that there are considerable limitations with these general values. For example, the dehydration point for many crops is significantly less than 15 Bar. Plant physiologist refer to P50 as a value that clearly defines a species’ tolerance to dehydration. One definition of P50 is the plant water potential value at which stomatal conductance is 50% of its maximum rate. P50 is also defined as the point at which hydraulic conductance is 50% of its maximum rate. 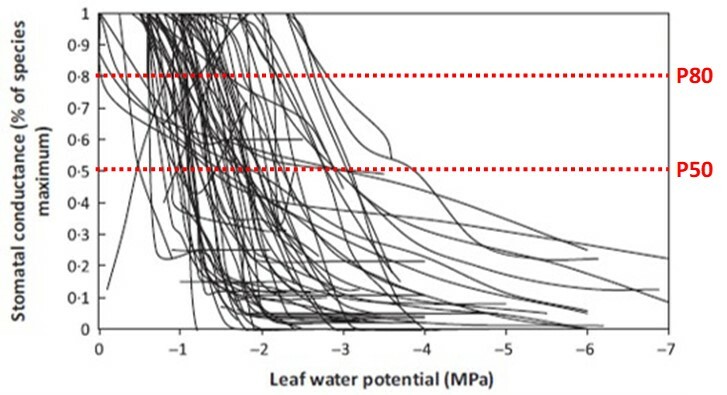 Klein (2014) summarised the relationship between stomatal conductance and plant water potential for 70 plant species (Figure 1). Klein’s research found that there is not a single P50 for all species, rather there is a broad spectrum of P50 values (Figure 1). Figure 1. The relationship between transpiration (stomatal conductance) and leaf water potential for 70 plant species. The dashed red lines indicate the P80 and P50 values. The irrigation refill point can be determined where the dashed red lines intersect with the data on the graph. Image has been adapted from Klein (2014), Figure 1b. 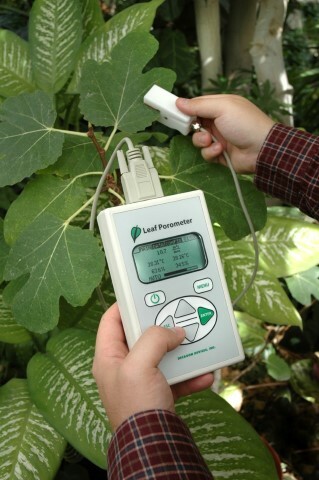 The SC-1 Leaf Porometer is a portable, handheld meter for measuring stomatal conductance. Irrigation curves were created for a citrus (Citrus sinensis) and macadamia (Macadamia integrifolia). Approximately 1.5m tall saplings were grown in pots with a potting mixture substrate. Stomatal conductance was measured daily, between 11am and 12pm, with a SC-1 Leaf Porometer. Soil water potential was measured by combining data from a MPS-6 Matric Potential Sensor and WP4 Dewpoint Potentiometer. 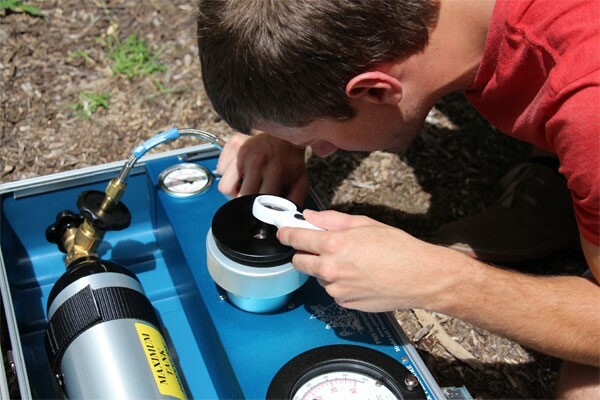 Soil water content was measured with a TEROS-12 Water Content, Temperature and EC Sensor. Data from the TEROS-12 and MPS-6 sensors were recorded continuously at 15-minute intervals on a ZL6 Data Logger. 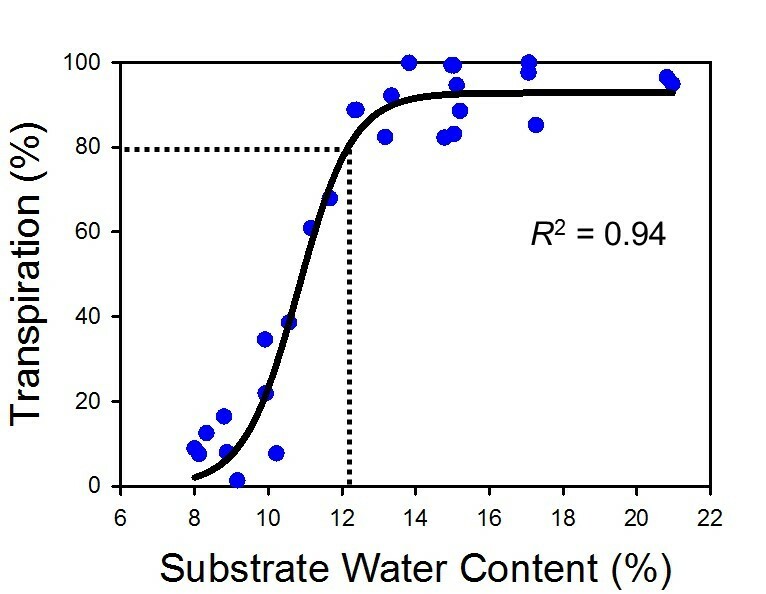 When stomatal conductance was measured, soil water content and potential were noted. At the start of the measurement period, plants were watered beyond field capacity. No further irrigation was applied, and the plants were left to reach wilting point over subsequent days. Figure 2 displays the soil water potential Irrigation Curves, with a fitted regression line, for citrus and macadamia. The P80 values are highlighted in Figure 2 by a dashed red line. P80 was -386 kPa and -58 kPa for citrus and macadamia, respectively. Figure 3 shows the results for the soil water content Irrigation Curves where P80 was 13.2 % and 21.7 % for citrus and macadamia, respectively.